Tonight Liliane fell asleep on the couch before I could tuck her into bed. The sight I came upon when I went looking for her was beyond precious. There she was, on the couch fast asleep, using Missy as a pillow to rest her head. Missy didn't seem to mind at all; she was fast asleep as well. I knew that capturing this picture of them would serve as confirmation of to the deep bond Liliane shares with our pets. Lillian has quite a thing for animals. Big ones, little ones, felines, and canines--she loves them all. Its amazing the affect animals have on her. 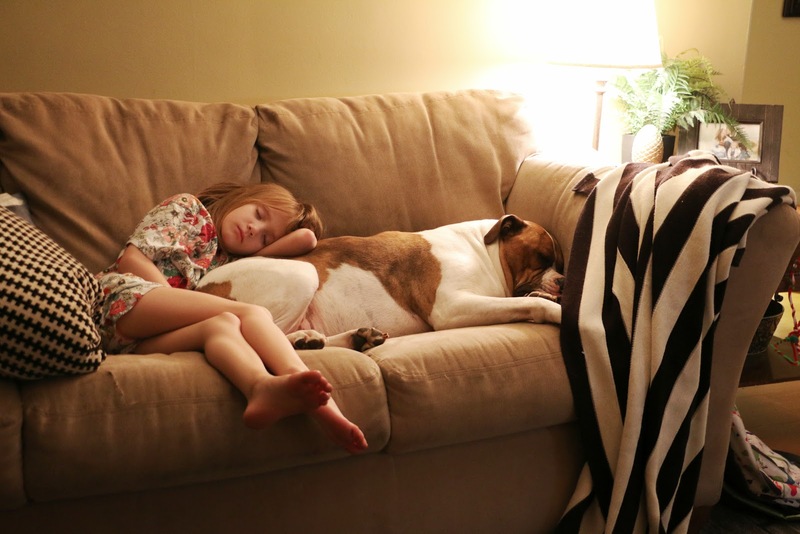 When she's had a bad day, she often seeks comfort in snuggling one of our three pets. Even so, putting Liliane to bed at night goes 10x more smoothly when I allow a fine-furry-friend to lay on her bed while she drifts off to sleep. The care and concern she holds for our pets is incredibly admirable. And the connection she has with each of them is unique and undeniable.